While most restaurants we visit reside within Portland, we occasionally go outside the city lines. Our ventures this week took us barely outside those lines to Westbrook, which has a semi-secret, tiny food scene of it’s own. The Frog and Turtle is the most upscale restaurant in Westbrook, but is still a casual, laid-back joint that is accessible to anyone. Having not been there in a while, we figured it would be a good opportunity to show a couple new Westbrook residents a great local place to dine. With reservations at 7:30, my wife and I arrived a little early and sat at two available bar seats. The bartender made eye contact, finished what he was doing, and brought us menus a couple minutes later. We let him know we had reservations, so he checked us in and we looked at drink and food options while waiting for our friends. Soon we were ready to order libations and I went back to an old favorite – The Swamp – Absolut, Midori, Pinapple, Orange, and a touch of Magic. Veering from her typical drink order, my wife had a…just kidding, she had her usual white wine. The “magic” part of The Swamp is dry ice. When the liquids in the drink are poured over the dry ice, it bubbles and steams like you might imagine a swamp would – at least in the movies. Add that to the swampy green color and it’s a really unique and inventive drink idea. But upon receiving my drink and sipping it from it’s martini glass container, I remembered what kept me coming back to the cocktail over and over again – it’s delicious. I’m going to go out on a limb and say The Swamp is one of the best drinks in greater Portland and it is probably the single most fun to order. It just brings a smile to my face every time. In addition to the drink quality at The Frog and Turtle, it should be noted that they have one of the very best bartenders around. 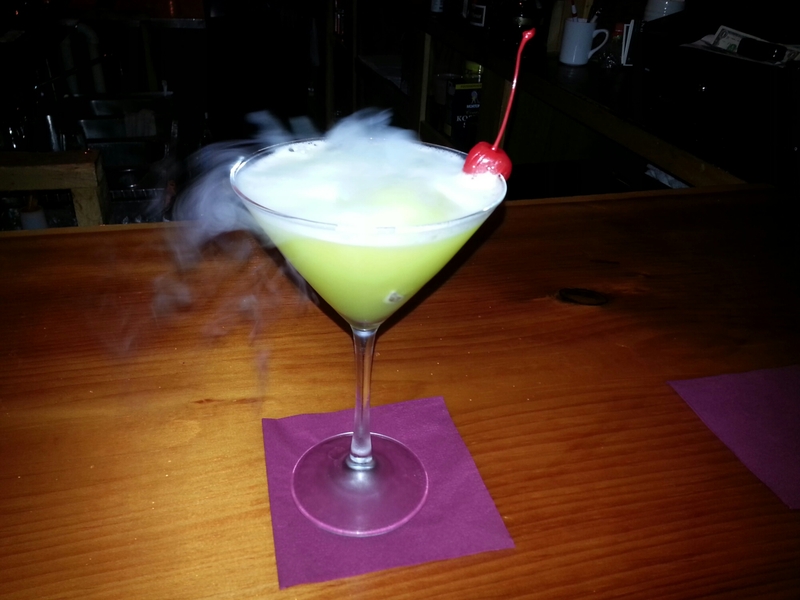 The drinks are exceptionally consistent and they are made quickly, but the bartender’s ability goes well beyond that. Regardless of how busy the bar is, you are never ignored and if you need assistance with anything else – food, checking in for reservations, etc. – he handles it without issue. He is also very knowledgeable if you have any questions. There are many good bartenders in Portland, but The Frog and Turtle is in the enviable position of having one of the very best. Once our friends arrived, we were almost immediately seated right by where we were standing. The hostess informed us that the drink tab could be rolled over to the table without issue which I think is one of the marks of a great restaurant. We sat, opened our menus, and sipped drinks and freshly poured waters. Our friends ordered beer and wine, and we talked a lot while barely looking at our menus. After a few minutes, the waitress returned which prompted us to seriously consider what to eat. She stated that everything was made from scratch which might cause a bit of a wait and recommended a couple options for appetizers and entrees. She left and returned a few minutes later and we threw her a couple appetizers for the table. We selected the Fried Calamari with charred greens and a creamy lime dressing and then I ordered one of her suggestions – Mushroom Beggars Purse with blue cheese, creme fraiche, and red wine syrup. When the waitress left to put in the apps, we focused our eyes upon the menu once again. I considered one of the burgers since I knew they were awesome and came with a number of topping choices including some great sauces. I also leaned a bit toward the House Battered Haddock which came with house chips, cole slaw, and tartar sauce. I hadn’t had fish and chips in quite a while, so when we put in our entree orders, I did indeed settle upon that. A flatbread, falafel, and a final order of the fish and chips rounded out the food fiesta we looked forward to finishing in a frenzy of furious fattening. Our appetizers took a little longer than I was used to waiting, but in the middle of a four-way discourse about the sociopolitical impact of lewd and lascivious conduct by trained circus clowns who later went on to become devout but untrained Juggalos, our first course arrived looking as beautiful as ever. The calamari, which I had tried on previous visits, looked exactly as I remembered it. It was pretty clear where the name of the mushroom appetizer came from. It looked exactly like a “beggar’s purse”. I was impressed at the incredibly appropriate nomenclature. After the food showed up, it was a free-for-all. With silverware flying and food being thrown around like baseballs from a pitching machine, I took a fork and knife swing at the puff pastry purse in front of me. I cut into it, taking a bite-sized piece with all the fixins, and put it on my plate. It looked great with a heavenly odor and a healthy helping of mushroom madness. I was slightly nervous about the blue cheese and hoped it wouldn’t be too strong. With the anticipation of a silkworm at shirt factory, I lured the food onto my fork and drove the fork into my oral cavity. Chew, chew,chew. Wow. Wow! WOW! The appetizer was awesome. The flakey puff pastry, mild blue cheese accent, and flavorful red wine came together with plenty of mushrooms to qualify as one of the very best apps I’d had in a long time. It wasn’t just a winner – it was a champion. The calamari was very good as always, but I was taken with the beggar’s purse. Everyone seemed to enjoy the appetizers. We finished them and then ordered another round of drinks. I switched to a Manhattan as I had been craving whiskey all day. We chatted a lot and at times I think the drinks increased our volume. Our waters were periodically filled and I began to feel as though it was taking a particularly long time to get our food. Then I began to know for sure that it was taking a long time. Sometime after that realization, the waitress let my wife know that they were out of mozzarella cheese for her flatbread. Not liking the other cheese choices, she opted for none at all. It was a little strange that they were out of mozz, but it wasn’t a big deal as my wife isn’t a super cheese-lover anyway. We waited a while longer and eventually our waitress apologized and pointed out that there was a very large party that was causing a delay in the food. The party had balloons tied to their chairs and looked to be about thirty to forty people. It could have been less or more, but that was my estimate based on a quick glance. It was hard to be upset since we were having a great time with our friends, but I was getting hungry. At some point, we got a five minute warning and a little while later our food did come out. It had been a long wait. My body was ready. I accepted an offer of catsup and malt vinegar, squeezed my lemon on my fish, and got started. There were two large pieces of fish, a bunch of thinly sliced chips, and a pile of cole slaw on the plate. I cut a piece of fish, ate it plain, and then cut another one and ate it with tartar sauce. The fish was very fresh and the portion was substantial. The batter was flavorful, but it was missing something. I had a hard time determining what it was. I think the issue with the fish was one of two things – either the portion of fish was too large for the amount of batter coating it or the batter just wasn’t potent enough and needed a little heat or kick of some sort. Either way, it wasn’t bad, but it needed something more. It was now time for me to devour a few chips. They were excellent with a bit of salt and a crispness that caused a crunch that registered on the Richter scale. Next, I tried the cole slaw. I loved it. It had a bit of onion which gave it a unique flavor, but they weren’t strong and simply added to the taste. Overall, the meal was great and everyone seemed very happy with their choices. We finished most of our entrees and partied like it was 2014 for a bit longer. A return trip from the waitress to our table had an unnamed party member accepting a dessert menu while the rest of us were convinced that another course was out of the question. Upon receipt of dessert menus, we looked intently, considering the recommendations we received. We placed an order for the Sundae Crepe with ice cream, caramelized bananas, chocolate and caramel sauce, and whipped cream. Fortunately, that order didn’t take as long as the rest of our food. When it came out, we were surprised with an additional dessert and told that they were both complimentary due to the long wait we had. The second dessert was the Chocolate Teardrop of Happiness which had chocolate mousse, raspberry compote, creme anglaise, and a chocolate truffle. They were both really well designed, particularly the latter, the foundation of which was a giant, teardrop-shaped piece of chocolate. Sitting and staring at our desserts for a bit, I realized my options were limited. I could stand up and overturn the table, run through the restaurant acting like a monkey, or dig into the dessert. Even though I wasn’t particularly hungry, I decided to dig in wholeheartedly instead of flinging poo. I took a piece of the very solid chocolate teardrop, some mousse, and some compote and creme. The light mousse and creme combined with the fruity compote and cold chocolate was perfectly named and definitely a dessert lovers dream. It was sweet, but not too sweet, with perfect textures coming together. I had a few bites and switched over to the Sundae Crepe for research purposes. That was also magnificent, though the chocolate and caramel were super sweet. It all worked perfectly together however, and kept me coming back for more. The deserts were a solid two for two and we left hardly a drop of deliciousness on either plate. Fortunately, good friends have a way of making time fly by, but after nearly a nearly three hour meal, it was time to wrap up. The meal came to about 100 first presidents after tip. I appreciated the desserts FOC as they certainly added to the meal and we enjoyed them greatly. Our drinks were great and our meals were very good except for a bit of underseasoning on one item. In the end, it’s safe to say that The Frog and Turtle is a fun spot in Westbrook for good times with good food. Get there soon in case a meteor shower destroys the planet as we know it and restaurants no longer exist. This entry was posted in Portland, ME food on May 5, 2014 by peterpeterportlandeater.